Abortion has been legal, in certain circumstances, in Great Britain for over 50 years. 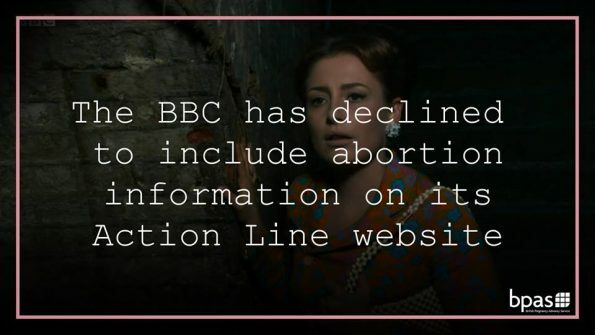 A group of healthcare bodies have published a letter to BBC Action Line asking Action Line to reverse its current stance on providing links to information about abortion following a recent episode of Call the Midwife in which one of the characters died as a result of complications from an illegal “backstreet” abortion. At the end of the programme, the BBC Action Line website was advertised for viewers who wished to seek information and support for issues covered in the programme. But a number of women who visited the website then contacted the charity the British Pregnancy Advisory Service, (bpas), saying that there were no sources of advice relating to abortion. In response to bpas raising their concerns about the omission of abortion support, BBC Action Line said that they had chosen to not include abortion because it is “contentious” and that including this information could be seen as “supporting one side”. 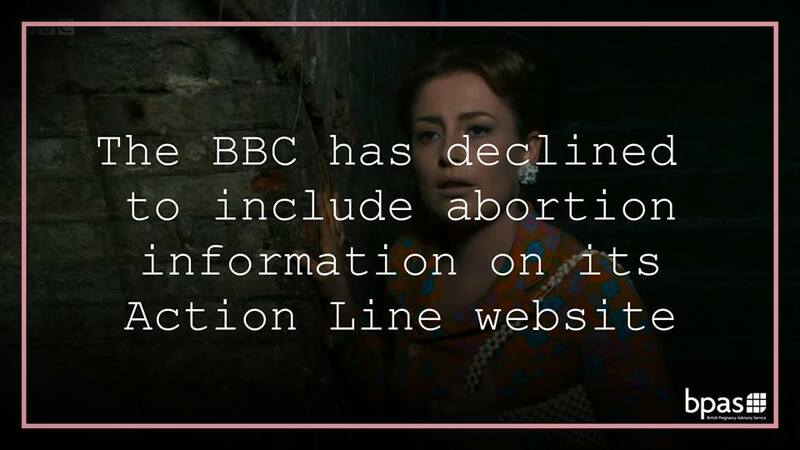 BBC Action Line said: “It isn’t possible for the BBC Action Line to offer support for abortion and similarly contentious issues without referring people either to campaigning organisations which take a particular stance on an issue or to organisations which provide it. “Doing so could imply the BBC supported one side or another in any contentious issue which it does not do in its coverage. Several healthcare bodies have now written to the BBC expressing their “disappointment” with this response and asking BBC Action Line to amend this position. The letter is co-signed by British Pregnancy Advisory Service (bpas), Brook, the Faculty of Sexual and Reproductive Healthcare (FSRH), Family Planning Association (FPA), Marie Stopes UK, the Royal College of Midwives and the Royal College of Obstetricians and Gynaecologists. Abortion, they point out “has been legal, in certain circumstances, in Great Britain for over 50 years, and 98 per cent of terminations are funded by the NHS. “Abortion is the most common gynaecological procedure in the UK, and one in three women will have an abortion in their lifetime. “Polling demonstrates that the vast majority of the public support a woman’s right to choose, including those with a religious belief. “Abortion is not a “contentious issue”– it is a routine part of NHS-funded healthcare, provided by doctors, nurses, and midwives every day in hospitals and clinics across the country. “The BBC Action Line response states that including links to information about abortion could imply the BBC “supported one side or another”. “However, in barring information the BBC is in effect “supporting one side” by treating abortion as different to all the other medical procedures and conditions the BBC choses to include. The healthcare bodies also provided links to evidence-based, impartial information for the BBC to consider. And they also stressed that their complaint lies solely with BBC Action Line and is in no way related to the programme Call the Midwife, which they said has repeatedly handled this issue “extremely sensitively and courageously”. The full letter and original response from BBC Action Line is available online here. To support this complaint to the BBC, click here.